Wheat was introduced to the human diet about 9,500 years ago in the Mediterranean region as part of the “Neolithic Revolution,” when humans began to transition from hunting and gathering food to settled agriculture. Today, worldwide wheat production is estimated at 723 million tonnes, and the average U.S. citizen consumes roughly 132 pounds of wheat per year. Gluten is the main protein complex found in wheat and related grains such as rye and barley, making up about 80% of their total protein content. Gluten is a unique protein in that our bodies do not possess the enzymes necessary to break it down completely (we do break most of it down), allowing fragments of the gluten protein to persist in the small intestine. In susceptible individuals, this can trigger three main forms of gluten reactions: wheat allergy, celiac disease, and non-celiac gluten sensitivity. Gluten-free diets are clearly recommended for people with celiac disease or for people with gluten sensitivity. Yet, the popularity of gluten-free diets for the treatment of countless other health conditions has exploded in recent years. Sales of gluten-free foods grew 34% to nearly $1 billion over the last five years, and gluten avoidance is commonly advised for both weight loss and chronic conditions. Yet there is little to no evidence to date supporting the use of a gluten-free diet in facilitating weight loss. In 2013, a group of researchers published the first controlled study investigating the effects of wheat gluten on a mouse model of diet-induced obesity. Their results suggested that gluten exposure was associated with weight gain, but failed to identify mechanisms explaining this link. The current study was conducted by the same group of researchers and aimed to fill this knowledge gap. Gluten-free diets are well-researched for the treatment of individuals with immune-mediated gluten sensitivities. However, they’ve been increasingly used for numerous other health conditions, such as obesity, despite a relative lack of evidence supporting a link between gluten consumption and weight gain. The current study sought to investigate whether wheat gluten causes weight gain, and explored potential mechanisms. This study divided 175 eight-week-old male mice into four groups and fed each a different diet for eight weeks: a control-standard diet (CD group), a CD added with 4.5% of wheat gluten (CD-G group), a high-fat diet (HFD group) to induce obesity, and a HFD added with 4.5% of wheat gluten (HFD-G group). No information on diet composition other than containing gluten or being gluten-free was provided. Typical rodent chow is a largely whole-food based pellet made mostly from soybeans, corn, fish meal, oats, and whey. By contrast, the standard high-fat chow is a semi-purified diet based on sugar, lard, soybean oil, and casein. The high-fat diet is much higher in fat and sugar content than the standard diet. The diets that had wheat gluten added were modified so that the nutritional composition was identical to their respective control diets, meaning that calorie and protein content remained constant. The mice had free access to food and water throughout the eight-week intervention. Bodyweight and food consumption were measured weekly. After eight weeks, some of the mice had their oxygen consumption measured via indirect calorimetry to calculate energy expenditure, while others consumed radioactively-labelled gluten to allow for measurement of intestinal absorption and biodistribution throughout the body. All mice were then euthanized to collect blood, liver, and fat tissue for analysis. The fat tissue collected included brown, subcutaneous, and visceral fat. All three of these types of fat had gene expression analyzed. The brown and subcutaneous fats were evaluated for changes in the expression of genes involved in thermogenesis, such as mitochondrial uncoupling protein 1 (UCP1, depicted in Figure 1) and bone morphogenetic protein 7 (BMP7). The visceral fat was analyzed for inflammatory-related genes such as interleukin 6 (IL-6), tumor necrosis factor (TNF), leptin, and adiponectin, as well as metabolic-related genes such as PPAR-alpha, PPAR-gamma, lipoprotein lipase (LPL), and hormone sensitive lipase (HSL). Four groups of mice consumed a standard control diet, a standard control diet with 4.5% gluten, a high-fat diet, or a high-fat diet with 4.5% gluten for eight weeks. Measurements relating to energy expenditure, gluten distribution throughout the body, and tissue analysis were made before and at the end of the intervention, while bodyweight and food intake were measured weekly. As expected, both high-fat diet groups consumed significantly more calories and showed significantly greater weight gain than both standard diet groups. Although gluten had no effect on calorie intake, the authors report that gluten-fed mice showed a significantly greater weight gain of about 20% by week 8 than their non-gluten counterparts. Gluten consumption was also associated with significant increases in visceral and subcutaneous fat tissue (by around 20-25%). Both gluten diets were associated with a significant reduction in fasted oxygen consumption compared to their respective non-gluten diets. Additionally, both gluten diets were associated with lower energy expenditure, although this difference only reached statistical significance in the high-fat fed groups. Radioactively-labelled gluten was detected in the stomach and small intestine after one hour. After two hours, the undigested portion of gluten was detected in the lower small intestine (ileum) and early large intestine (cecum), and then exclusively within the large intestine after four and six hours. Gluten peptides were absorbed and detected in the blood, liver, and visceral fat tissue as soon as 30 minutes after ingestion. Gene expression analyses of brown fat tissue showed a significant reduction of UCP1 and significant increase of PPAR gamma coactivator 1-alpha (PGC1-alpha) in the HFD-G mice compared to the HFD mice. But no differences were found in gene expression in brown fat between the CD and CD-G mice. 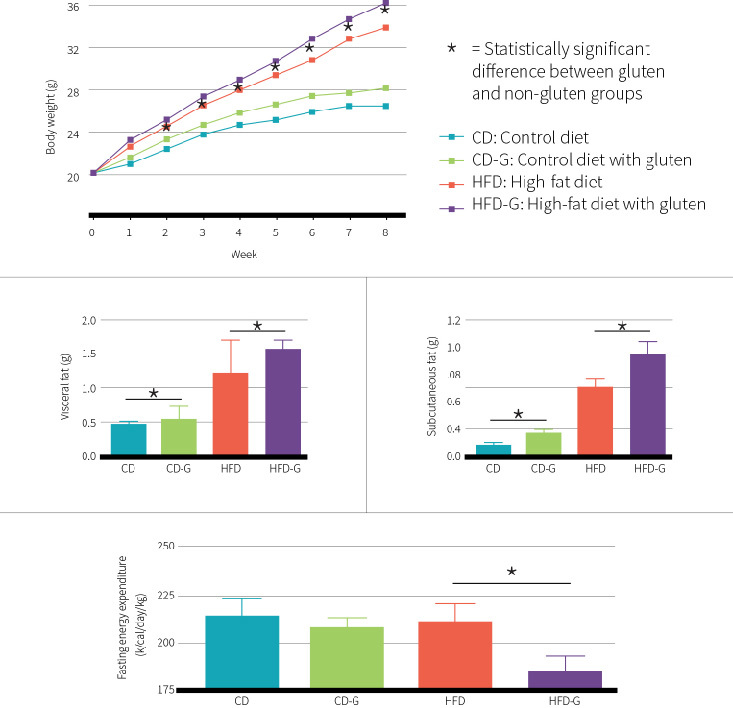 In subcutaneous fat tissue, UCP1 and BMP7 expression were significantly reduced in both gluten-containing diets compared to their respective non-gluten diets. Finally, CD-G mice showed a significant increase in IL-6 and a marginally significant increase in TNF within their visceral fat tissue when compared to the CD mice. The HFD-G mice showed significant reductions in adiponectin, PPAR-alpha, PPAR-gamma, and HSL than the HFD mice, with no changes in IL-6 or TNF observed. Gluten consumption caused increased weight and fat gain and decreased energy expenditure regardless of background diet, although the effects were more pronounced in mice fed a high-fat diet. Additionally, gluten consumption was associated with numerous changes in gene expression and inflammatory and metabolic markers in brown, subcutaneous, and visceral fat tissue. Intact gluten peptides appeared to enter the bloodstream soon after consumption and were detectable within the liver and visceral fat tissue. This study tells us that some gluten peptides may be able to reach extra-intestinal organs such as visceral fat tissue, although most of the gluten was not absorbed and passed into the colon. The finding of gluten peptides in circulation, the liver, and visceral fat tissue was associated with changes in gene expression that may have promoted fat gain, at least among mice consuming a 4.5% gluten diet. However, more research is needed to identify the precise mechanism of weight gain and changes in gene expression, as it is possible these effects were secondary to immunomodulation rather than direct action of gluten peptides. These findings confirm and extend those of previous research by the same authors. Unfortunately, the lack of supporting evidence makes it difficult to be confident in the practical relevance of these findings, especially in light of study limitations like the use of mice, the background diet, the dose of gluten, and the timeframe of consumption. The fact that mice were the study subjects as opposed to humans goes without saying as a study limitation, and further research will be required to see if similar findings are observed in humans. It has been shown that intestinal epithelial cells in tissue samples exposed to gluten exhibit increased intestinal permeability in both patients with celiac disease and healthy controls. This effect is mediated by gluten’s interaction with the protein zonulin that is responsible for regulating the integrity of tight junctions within the intestinal tract. Therefore, it is possible that gluten peptides may appear in circulation in humans after consumption, where it may then travel to extraintestinal tissues and mediate gene expression, as suggested in the current study. Whether any gene-modifying effects (assuming they occur) would lead to weight gain is controversial. One of the observed changes in gene expression was a down-regulation of UCP-1 in brown fat tissue. Genetically removing UCP-1 has been shown in mice to induce obesity and negate diet-induced thermogenesis, making this a likely candidate to explain the increased fat gain. Although brown fat is found in adult humans, it exists is far lower quantities relative to overall body size than in mice. Accordingly, the degree to which it influences energy balance in humans remains unknown. There are also genetic differences in brown fat gene expression between mice and men, leaving open the possibility that gluten may interact with brown fat differently in humans. Changes in gene expression were not limited to brown fat, however. Subcutaneous fat showed a reduction in the expression of BMP7, which has been implicated in the creation of brown fat. The process of turning white fat, such as subcutaneous fat, into brown fat is known as “browning” and leads to the creation of “beige” or “brite” (from “brown-in-white”) fat that shows thermogenic activity similar to classical brown fat. Beige fat has been investigated as a potential anti-obesity agent in humans. Accordingly, a reduction in its creation could hypothetically make weight gain easier. Visceral fat showed disparate reactions to gluten depending on whether the mice were fed a standard diet or a high-fat diet. The standard-fed mice showed increased expression of inflammatory molecules, while the high-fat-fed mice showed reductions in enzymes involved in fat metabolism. The causes of these different responses were not explored in the current study and require further investigation. The background diet plays a large role in how dietary modifications are handled by the body. Notably, the gluten was contained in each and every food pellet that the mice consumed, meaning they had constant exposure when they ate. How would the results differ if gluten intake was more intermittent? Also, how would the amount of protein, fiber, and other nutrients in the diet influence how gluten affects health? It is well established that fiber promotes a healthy microbiome and strong gut barrier. How much gluten is required to see a health effect? 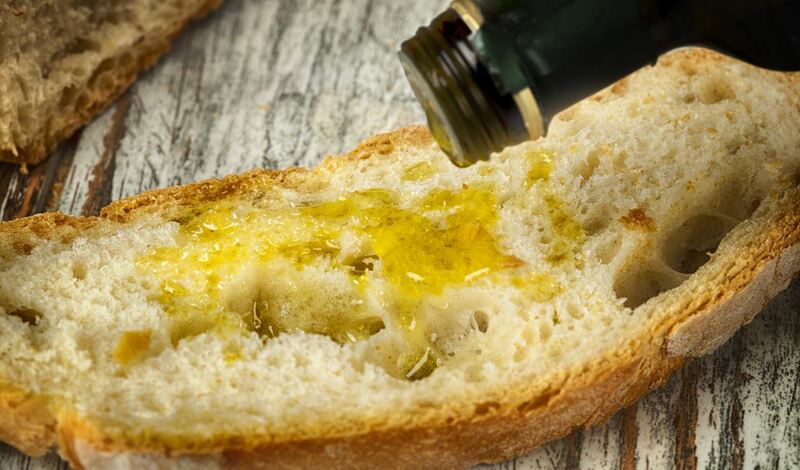 Gluten consumption at 4.5% of the diet would correspond to an intake of about 60 grams daily, assuming an average intake of three pounds of food by an adult human. Gluten is roughly 80% of the protein in wheat, meaning that someone would need to consume about 75 grams of protein from wheat products daily. This is about 20 slices of whole wheat bread. How a lower and more realistic intake of gluten would affect health is another question that requires further investigation. Finally, because measurements were made after the intervention, it is unclear whether the changes in gene expression were the cause of the weight gain, or the result of it. The researchers measured bodyweight on a weekly basis, but measured gene expression and respiration only at study start and study end. It would have been more insightful if these latter measurements were made earlier in the study before meaningful differences in weight emerged, to strengthen the evidence suggesting that these changes did indeed cause weight gain, since causes precede effects. The study under review tells us that mice consuming the equivalent of 20 slices of whole wheat bread daily (in terms of gluten content) had metabolic alterations that promote reduced energy expenditure and increased fat gain, possibly through a direct effect on fat tissue. How this study would play out in humans remains unclear. Several studies have investigated the influence of a paleolithic type diet comprising lean meat, fruits, vegetables, and nuts, and excluding food types such as dairy, legumes, and cereal grains, on health. Two of these studies have been covered in past issues of the ERD (Issue 8 & Issue 6), both of which showed that a paleo diet was superior to a conventional diet in the treatment of metabolic syndrome and type 2 diabetes. However, positive results from paleo diet studies do not imply that benefits were due to gluten exclusion. 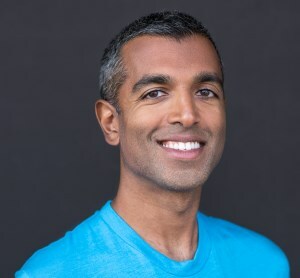 In addition to the numerous paleo diet books and advocates, there are those who specifically place blame on wheat, such as in the books “Wheat Belly” or “Grain Brain.” Although the claims in these publications have been debated in the literature (such as pro-grain arguments here and here, there doesn’t seem to be a scientific consensus on any of the various issues. No research outside of the current study author’s lab has investigated mechanisms behind the potential obesogenic effects of gluten consumption. However, a meta-analysis of 45 prospective cohort studies and 21 randomized-controlled trials found that whole-grain consumers were at a lower risk of type 2 diabetes, cardiovascular disease, and weight gain, and whole-grain interventions led to favorable effects on glycemic control and blood lipids. These findings are also supported by the American Society for Nutrition position statement. The majority of this research compares whole grains to refined grains, both of which have the same gluten content. That being said, it’s difficult to pin down the effects of wheat, especially when the majority of evidence is observational in nature and hence subject to many confounders. Further support for the observational evidence linking whole grains to a reduced weight comes from interventions that prescribe the consumption of whole grains under hypocaloric conditions. Yet, there are many types of whole grains and it is possible that gluten consumption remains low. It could be that a diet low in wheat gluten but high in other whole grains like oats leads to the best outcomes. Further controlled research, especially in humans, can help shed light on this complex topic. Previous research (mostly observational in nature) has established a link between better health and whole grain consumption, but this may not apply specifically to wheat. Accordingly, perhaps a whole grain diet without wheat gluten is beneficial, although future research will need to investigate how wheat gluten influences health in humans specifically. How does the wheat variety influence its gluten content? 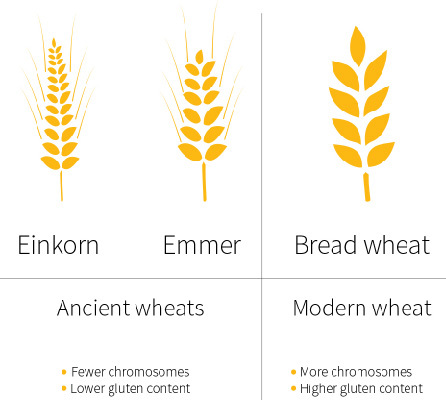 The earliest cultivated forms of wheat were einkorn and emmer (see Figure 3). Since then, farmers have systematically crossbred wheat for higher yields, adaptation to climate changes, better bread-making characteristics, and improved disease resistance. Today, about 95% of all wheat is bread wheat. Some research suggests that individuals with celiac disease react to a specific component of gluten called Glia-α9, which is more prevalent in modern wheat varieties compared to their ancestors (owed in part to the lower genetic diversity of modern wheat). In support of this, intestinal cells obtained from celiac disease patients did not show the expected inflammatory and immune response seen with bread wheat when exposed to einkorn wheat. Thus, while both varieties contain gluten, genetic differences in its structure may make ancient wheat varieties less damaging to individuals sensitive to gluten. This study suggests that wheat gluten (or at least fragments of it) is able to leave the intestinal tract and influence fat metabolism. However, this study has notable limitations, such as being conducted in mice and using a dose of gluten similar to eating 20 slices of whole wheat bread daily. The connection between gluten and weight gain has not been well investigated, and the current study findings necessitate further research to determine how gluten consumption impacts human health.